Tamaki Shrine (玉置神社) is one of the UNESCO World Heritage Sites located in southern Nara prefecture. 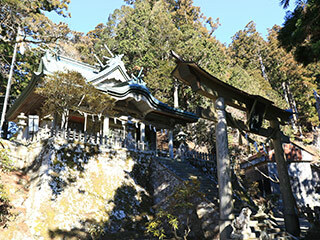 It is considered the most sacred place of all Kumano pilgrimage. This shrine was established over 2000 years ago. It is the deepest and highest shrine of Kumano 3 major Shrines. Tamaki Shrine is located on the top of Mt. Tamaki, 1,076.4m from the sea level, and has a beautiful forest. Tamaki Shrine is located in Totsukawa Village, Nara Prefecture. It is one of the sacred mountains of Omine mountains and considered as the most sacred place in Kumano. This shrine is located on the top of Mt. Tamaki. It is a very important place for Kumano pilgrimage and Shugendo of Kumano Kodo. Therefore, it is chosen as one of the "Sacred Sites and Pilgrimage Routes in the Kii Mountain Range" of the UNESCO World Heritage Site. This shrine established in 37 B.C.E and located on the top of Mt. Tamaki. The forest of the top of the mountain has the sacred power of gods of Kumano. Therefore, Tamaki Shrine is considered as the deepest high shrine of Kumano Shrines. Because this shrine is also located on Kumano pilgrimage, this shrine has the function of the hotels for all Shugendo monks. The main hall is constructed in 1794. The office building is constructed in 1804 and registered as the national important cultural assets.